Please arrive between 7 and 7:30pm. Running Time: 2 hours including 2 intermissions and dinner. If you have last-minute, night-of-show questions, please contact concierge@cafenordo.com. In an artistic collaboration with Café Nordo in Pioneer Square, a four-course meal will deliciously underscore a signature Book-It theatrical experience. 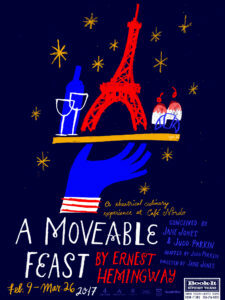 Ernest Hemingway’s A Moveable Feast captures what it meant to be young and poor and writing in Paris during the 1920s. Hemingway and his wife Hadley kept company with a slightly rag-tag circle of artists and writers including F. Scott & Zelda Fitzgerald, Ezra Pound, Paul Cézanne, and Sylvia Beach in the salon of Gertrude Stein at 27 Rue de Fleurus. These artists’ hunger to create translates into an immersive blend of music, story, passion, and pleasure underscored by sumptuous cuisine that will warm your body and spirit. Your ticket includes a four-course meal and sparkling cocktail to start off the night. There will be vegetarian and gluten-free options for our guests. Any more complicated allergy or restriction may be subject to a small up charge. Please email chefnordo@cafenordo.com with any menu questions. Spend a romantic evening dining in Hemingway’s Paris with your Valentine! The Valentine’s Day special performance includes the gift of a red rose for every couple and two glasses of premium French wine in addition to a champagne cocktail. Tickets for the Valentine’s Day performance are $215 per couple. Purchase yours here.